The most successful theory in all of science -- and the basis of one-third of our economy -- says the strangest things about the world and about us. Can you believe that physical reality is created by our observation of it? Physicists were forced to this conclusion, the quantum enigma, by what they observed in their laboratories. Trying to understand the atom, physicists built quantum mechanics and found, to their embarrassment, that their theory intimately connects consciousness with the physical world. Quantum Enigma explores what that implies and why some founders of the theory became the foremost objectors to it. Schrödinger showed that it "absurdly" allowed a cat to be in a "superposition" simultaneously dead and alive. Einstein derided the theory's "spooky interactions." With Bell's Theorem, we now know Schrödinger's superpositions and Einstein's spooky interactions indeed exist. Authors Bruce Rosenblum and Fred Kuttner explain all of this in nontechnical terms with help from some fanciful stories and bits about the theory's developers. They present the quantum mystery honestly, with an emphasis on what is and what is not speculation. Physics' encounter with consciousness is its skeleton in the closet. Because the authors open the closet and examine the skeleton, theirs is a controversial book. 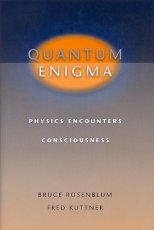 Quantum Enigma's description of the experimental quantum facts, and the quantum theory explaining them, is undisputed. Interpreting what it all means, however, is controversial. Every interpretation of quantum physics encounters consciousness. Rosenblum and Kuttner therefore turn to exploring consciousness itself -- and encounter quantum physics. Free will and anthropic principles become crucial issues, and the connection of consciousness with the cosmos suggested by some leading quantum cosmologists is mind-blowing. Readers are brought to a boundary where the particular expertise of physicists is no longer a sure guide. They will find, instead, the facts and hints provided by quantum mechanics and the ability to speculate for themselves.